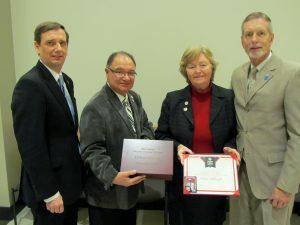 On Monday, Dec. 3, during its business meeting, the New Jersey Council of County Colleges (NJCCC) honored Camden County College Trustee Helen Albright Troxell, who served as Chair of the NJCCC for the past four years. The NJCCC presented an engraved jewelry box, and Rowan College of Burlington County presented a “3 + Wonderful” diploma to her for her visionary leadership as head of the state association that strengthens the 19 community colleges in the state. Pictured, from left: NJCCC President Aaron Fichtner, newly-elected NJCCC Chair Phil Linfante of the Warren County Community College Board of Trustees, Ms. Albright, and Camden County College President Don Borden.